Prototype: 5 different design German Federal Railroad (DB) express train passenger cars for the "F" train F 10 "Rheingold". 1 type AD4um-62 vista dome car with a raised dome compartment and service areas beneath it. Vista dome with 8 side windows. 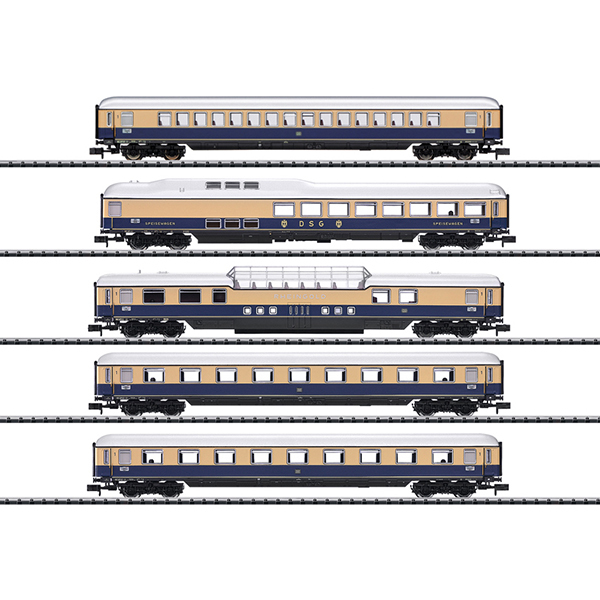 2 type Av4um-62 compartment cars. 1 DSG type WR4um-62 dining car. 2 dining areas, galley, dishwashing area, buffet, and personnel compartment. Raised roof over the galley ("Buckel-Speisewagen" / "Humpback Dining Car"). 1 type Ap4um-62 open seating car. The cars look as they did the summer of 1962. Model: All of the cars have close coupler mechanisms. Except for the vista dome car, LED interior lighting can be installed in all of the cars. 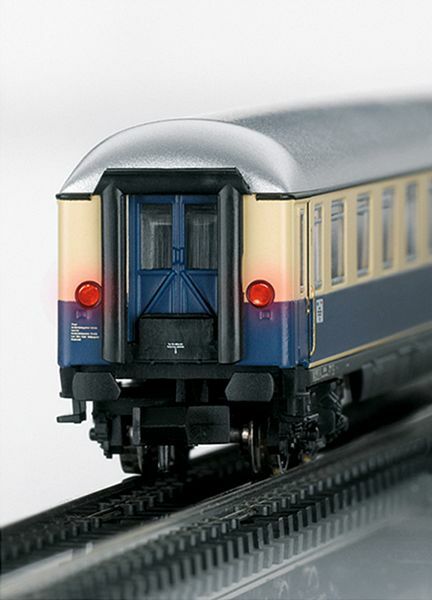 One compartment car, 1st class, has LED marker lights. Total length over the buffers 825 mm / 32-1/2".